The luxury version of the Huawei Watch 2 has just made its debut in Europe after being officially unveiled many months ago at Mobile World Congress (MWC) 2017 trade fair. The smartwatch can now be bought in just about any European country (including the UK) for no less than €795. That's quite a hefty sum since specs-wise there are no differences between the standard model and the one designed by Porsche. Visually, the luxury smartwatch comes with a ceramic speedometer and watch faces designed by Porsche, which feature one touch chronograph function inspired by the company's sports car dashboard. 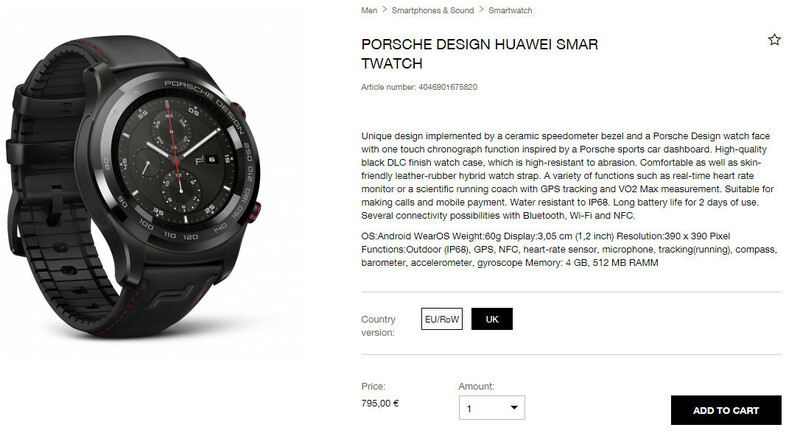 Although Porsche Design Huawei Watch 2 doesn't come with LTE support, it does feature GPS tracking, IP68 certification, NFC (Near Field Communications), heart-rate sensor, microphone, compass, accelerometer, tracking (running), and gyroscope. It also sports a 1.2-inch AMOLED display with 390 x 390 pixels resolution, 4GB internal memory, 512MB RAM, and Snapdragon Wear 2100 processor. Or, you can get all of these features for just $370, the price of the regular Huawei Watch 2 smartwatch, but that won't make you stand out, right? No thanks. I will keep my smart enough watch. 15 dollar Casio. Lol. Guess you can say has decent battery life. IDK, about 6 years I would say. Since everytime there is an article about a smartwatch, it's mandatory for someone to mention their sub-$30 Casio, I need to start asking questions about this great Casio. 1. How is the stand-alone GPS. Is it accurate for running, biking, hiking? 2. Is there an LTE version? 3. Are the notifications pretty accurate so that you don't waste time pulling out your phone for spam email? This seems important since everyone is talking about ways to unlock their device and where the FPS is? 4. Speaking of unlocking, does the Casio have smart lock, to keep your phone unlocked as long as the watch is connected? 5. If you lose your phone, will the Casio help you find it? 6. Will the Casio notify you if you are leaving your phone behind? I know Casio makes a watch that's pretty good at these things. But, it's closer to sub$400. The best thing about is that if you get it, you can still keep your smart enough watch. There is no requirement to throw it away. Everyone needs a Twatch especially if its a Smar one. What's with Porsche design? I want a watch that's designed by a famous watch maker. I couldn't give a monkeys if it was designed by a car company. Would look better if it didn't have the big Porsche Design engraving on the front. Makes it look cheap.